Southern Conceptualisms Network is an international platform for collective production, reflection, and setting in common of a political position. This network was founded towards the end of 2007 by a group of researchers concerned with the need for a political intervention into the processes of neutralizing of the critical potential of a set of "conceptual practices" which had taken place in Latin America since the 1970s. The affiliation between the Southern Conceptualisms Network and the Museo Nacional Centro de Arte Reina Sofía sets out to deal with the dominant circuits of cultural production, running from north to south, and replace them with horizontal programmes that include south-south routes between archives, museums, researchers, artists and institutions that are equally anomalous. This joint project seeks to transform traditional museum policies and integrate network practices and decision-making at the heart of the institution, thus fusing the potential of the archive in the Collection and generating new shared legitimacy in cultural production and historical narration. Museo Reina Sofía attempts to address the dynamics of fragmentation and dispersion of the material and immaterial legacy of the poetic and political practices that have taken place in Latin America since the 1960's, and, similarly, to imagine and set in motion a set of more horizontal and more logical decolonizing policies of shared production of knowledge, in the face of the conventional model of acquiring and displacing the Latin American documentary assets to central countries. Southern Conceptualisms Network is an exercise of research as political resistance, premised on the recovery of an expropriated historical memory. The current dissemination of artistic productions and documents focused on the work of RCSur endeavours to promote the inscription of its emotional memory in the emancipatory struggles that, on a Latin American and global scale, are currently positioned against global capitalism. The collaboration between Southern Conceptualisms Network and Museo Reina Sofía doesn't consist in selecting research subjects according to the interests of the institution, and neither is it a case of researchers locating new acquisitions, but, rather of building a public, digital archive which can reclaim the public nature of the documents of Latin-American Conceptualism, which, due to its political and social context, represent a manifestation of protest against the dictatorial imposition in the continent. In this sense, the Museum is working, together with Southern Conceptualisms Network, on a series of projects which not only aspire to producing an active critical platform, but also to transform the policies of cultural heritage which the modern museum is based on. Thus, Museo Reina Sofía attempts to question the model of colonial collecting, which follows the rules of a market based on the scarcity of goods, with the intention of raising an urgent debate on the need to consider museums as custodians, and not owners. It is our intention to create collections-archives shared with other local institutions, which will allow a questioning of the laws of ownership and the restrictive constitution of reproduction rights: a fight we consider important in order to build a critical memory without plundering the memory of others. The affiliation between the Museo Reina Sofía and the Red Conceptualismos del Sur has been forged and mobilised precisely in order to offset the drainage flow of memory from this time period and to rekindle its legacy in the present by way of open-access research, exhibitions, publications and databases. 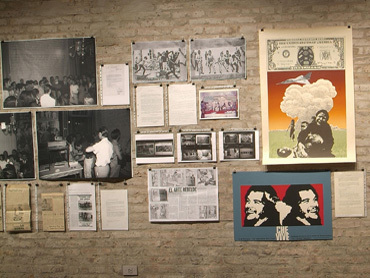 Some of the results of this collaboration, for instance the archives related to creative strategies in the human rights movement in Argentina, or the activities of the Chilean group CADA (Colectivo de Acciones de Arte), have been presented within the context of the exhibition Losing the Human Form. A Seismic Image of the 1980s in Latin America, held in the Museo in October 2012.
the existence of an important critical and research mass in Latin America offers us the possibility of a new effective re-activation of the relational and contextual potential of the archive. The Museum is committed to backing up the project politically and to searching for resources which can allow the development of this initiative, its digitalization and its on-line publishing, thus raising awareness about it, and opening it up for study and debate.